Life’s usually pretty amazing. But when it throws an emergency at you, can your wallet handle it? According to a recent study by the Urban Institute, nearly 22% of adults struggled to cover a $400 unexpected expense. People between ages 18-34 were hit the hardest and were more prone to using risky, high-interest means like credit cards to make ends meet, resulting in greater financial stress. To avoid facing the same fate, you need to build and maintain a healthy emergency fund. What’s that? It’s a pool of money that’s only gets used when life throws you a major curveball. That way, when your car breaks down, your pet gets sick, or you lose your job, you’ll have the cash stashed away to deal with it without taking on more debt. Follow the steps below and you’ll be well on your way to dealing with the unexpected with ease. Since everyone’s situation is different, there is no hard and fast rule about how much you need to have in your emergency fund. However, the collective personal finance mind says that you should strive to save 3-6 months of living expenses. If you’re the breadwinner for your family or your income fluctuates, it doesn’t hurt to save more than 6 months just in case. To gauge your essential monthly expenses, take a look at your budget (or create one) and add up all of your must-haves like shelter, food, transportation, utilities, medicine, minimum debt payments, etc. Remember, since some of your expenses can vary month to month, be sure to save yourself some extra money for those variables. Next, multiply your monthly budget by the number of months that you want to cover. The total is your emergency fund savings goal. Your emergency fund should have its own account that you can tap into when needed, but that you won’t see or touch regularly. This will make it tougher to spend the money on other, less dire situations. And, although it may be tempting, avoid putting the funds into risky investments like stocks because you could lose money if the market declines. To get the best results, consider putting this cash into a flexible asset like Singapore Government Savings Bond (SSB) or a high-yield savings account. It will be safe, separate from your day to day finances, and will actually grow a little due to the slightly higher interest. The first two steps are quick and easy to complete. However, depending on your needs and your means, you could be in this phase for a long time. Saving thousands (maybe even tens of thousands) of dollars is a daunting prospect. Don’t be discouraged! Start small and initially aim to get a few hundred in the bank. Then, work your way up and celebrate each milestone. What you’re doing isn’t easy. But when life inevitably throws a tantrum, it will be worth it. Cut expenses and bank the savings. Tight budget? Check out these tips. Automate your savings. Set up a regular transfer from your normal account to your emergency fund account. Earn more cash. Think about starting a side hustle, working overtime, or selling your unused stuff. Put windfalls to good use. Gifts, bonuses, and tax refunds can make your emergency fund balance soar. Tip: While building an emergency fund needs to be a priority, it’s OK to juggle more than one financial goal. For example, if you have high-interest credit card debt, it’s a good idea to get that paid off ASAP. It’s important to find the right mix of saving and debt pay off for your situation. Now that you’ve saved up your emergency fund, you’re in a great position to ramp up (or start) saving for retirement, put money aside for planned home repairs or upgrades, or open an account to fund the vacation of your dreams. You can also put more money toward your mortgage, student loans, or other debts. 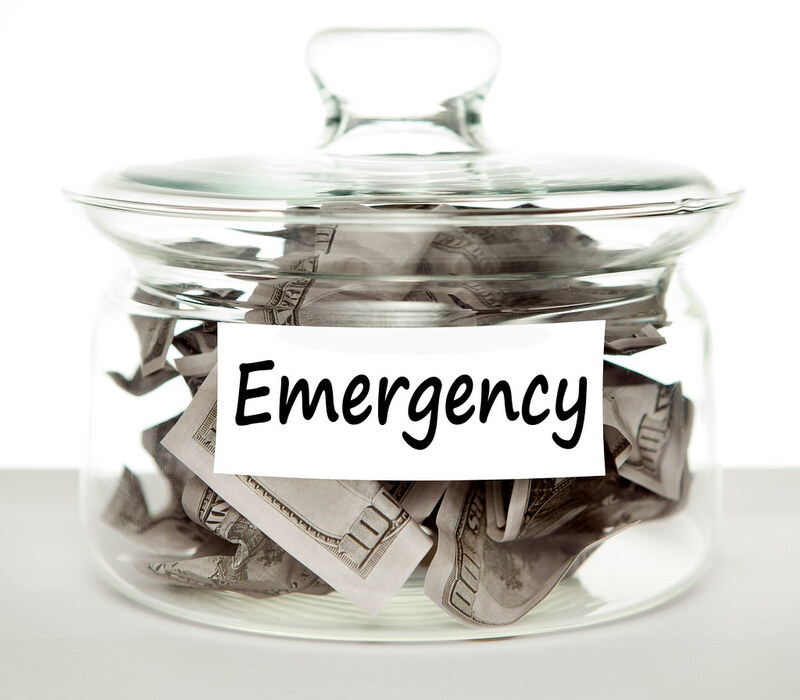 Of course, if you take money from the emergency fund, you should replenish it as soon as possible. Building a solid emergency fund doesn’t happen overnight. Just like with retirement, it takes discipline and patience to save a large amount of money for “someday.” But — having that well-inflated cushion will allow you to rest easy and fully focus on living your best life.